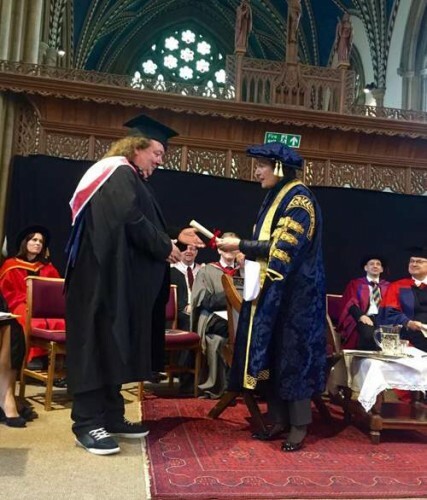 Bernie Marsden has been awarded a honorary Master of Arts degree by his home town University of Buckingham. The presentation speech delivered by Professor John Clarke lists Bernie’s numerous achievements, from scoring a #1 US hit with Here I Go Again, to his recent charity work. We all at The Highway Star would like to extend our warmest congratulations. Posted by Nick Soveiko on Tuesday, April 28th, 2015, filed under Blog. You can follow comment on this post through the RSS 2.0 feed. You can skip to the end and leave a comment. Pinging is currently not allowed. Congratulations, and have a nice Day! I think Bernie wrote a ton of great songs with Whitesnake…. As far as that BB King quote…. Gary Moore was white too! Neither come close to Gary Moore (RIP)….. The original version of “Here I Go Again” from Saints and Sinners was much better than the remake on the 1987 album. Actually I really did not like the remake that much. Just my opinion. Congratulations Bernie! I’d like to join this list of felicitators. Congratulations. I’m very happy that Bernie has been given credit for his outstanding musical talent by the University of Birmingham and even B.B.King himself, too. He deserves it!! Bernie is about waaayyy more than that, and a very nice person on top, as I was blessed to be able learning at several occasions over the past decades. Keep on being Bernie, Bernie!! You’re a great bloke. Hope to see you again, somewhere down the road.